Did you know immigrants are twice as likely to start a business than a native-born American? Learn about some of the struggles and joys of immigrant entrepreneurship through the videos below which were filmed during the panel discussion events at Monroe Community College and SUNY Brockport. 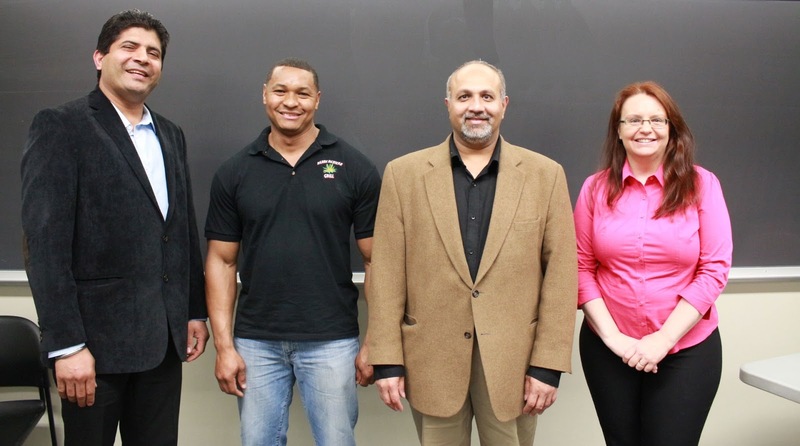 Jennifer Kumar, Managing Director of Authentic Journeys and Panel Discussion moderator stands with Rajwinder Singh (far left), Narciso Cruz, and Dr. Nilesh Patel during the panel discussion at Monroe Community College (picture, right). Scroll below the videos to contact the entrepreneurs and more background information on these events. Videos courtesy JMAX Media Solutions. To celebrate the achievements of all entrepreneurs and small business owners, the U.S. government proclaims one week every year to highlight their achievements in what is called the National Small Business Week. In 2016, National Small Business Week happened between May 1 and May 7. Authentic Journeys is a small business, a woman-owned business and a foreign-owned business in India. Jennifer Kumar, the Managing Director of Authentic Journeys is an American Expat who moved to India in 2011. Through Authentic Journeys, Jennifer has been interacting with a wide range of businesses including small businesses, startups and medium sized enterprises (MSEs) that have business relationships with American clients and counterparts. Earlier in 2016, Jennifer spoke at the conference called Intelligent Outsourcing talking to local Kochi business owners on tips on doing business with Americans from India and in tips in doing business with Americans in the U.S. While many local Kochi startup entrepreneurs work locally, some do have offices or sister concerns in the U.S. Naturally, in such cases they require assistance to learn American business practices and business culture. While they may not be immigrants doing business in the U.S., they are foreign- born international business people running subsidiary small businesses in the U.S. that also contribute to the American economy. JMAX Media Solutions is an immigrant-owned business in Rochester, New York. The firm has experience in developing feature-rich, user friendly and efficient applications for varied industries and clients across the globe. Learn more at their website. Job Valluthamannunkal, CEO of JMAX Media Solutions (far left), stands with Rajwinder Singh, Nabil Albusaad, Dr. Nilesh Patel, Nilesh's wife, and Jennifer Kumar. Are you an immigrant or foreign born entrepreneur in the U.S.? Do you need help with presentation skills, business interaction or U.S. business and cultural understanding to pull in more business or influence more people? I can help you! Authentic Journeys provides individualized tailor made coaching to help you excel in your business communication and strategy. Learn more about business coaching, success and career coaching for skilled immigrants in the US.